Wednesday, December 19th & Thursday, December 20th the Los Cancioneros Master Chorale Ensemble will perform Christmas and Chanuka favorites tableside for the enjoyment of dining guests. 6:30 p.m. The Admiral Risty, 31250 Palos Verdes Drive West, Rancho Palos Verdes. Reservations recommended. (310) 377-0050 or visit admiralristy.com. 10:45-11:45 a.m. Explore Jesus’ own words that he is the light of the world; the way, the truth and the life; and the gate and the shepherd; and then discuss how what we discover can help us live more fully. Free community classes in Reeves Hall. Refreshments served and child care available. St. Peter’s by the Sea, 6410 P.V. Drive South, Rancho Palos Verdes. (310) 377-6882. For more information visit StPetersPres.org. Michael Herzmark ace San Pedro-based classic rock band does some of the best of pop, country and R&B hits that you haven’t heard in years; The Monkees, Faron Young, Paul Revere and The Raiders and more. 4 p.m. Grand Annex, 434 W. 6th St., San Pedro, (310) 833-4813. PVE-CARE for our seniors, support for independent living. Seniors and adult children. 4 – 6 p.m. A festive family gathering in the holiday spirit. A time to start talking about What’s Next? PVE-CARES invites aging individuals and their adult children to join us for a holiday happy hour. Learn the answers to question you may have such as: Whens the right time? Why do we procrastinate? Where should I go? There will be a cash bar, light hors d’oeuvres and lots of good cheer! RSVP by November 3. (310) 750-9788. Palos Verdes Golf Club, 3301 Via Campesina, PVE. 8:30 a.m. By the Palos Verdes Peninsula Land Conservancy at White Point Nature Preserve. Join Wild Birds Unlimited to explore the birds that make the White Point Nature Preserve home. All ages welcome. Binoculars supplied for beginners. The program is free and open to the public. White Point Nature Preserve is located at 1600 W. Paseo del Mar in San Pedro. RSVP at: www.pvplc.org. Help attract butterflies and other pollinators! George F Canyon: 10 a.m. – 12 p.m. and White Point: 12 p.m. – 2 p.m. By the Palos Verdes Peninsula Land Conservancy at George F Canyon and White Point Nature Centers. Colorful, drought tolerant plants are now available at the monthly plant sale. These plants are grown from seeds harvested on the Peninsula and raised at the Conservancy nursery. The plants look beautiful and help attract butterflies and other pollinators. Plants sold on first-come, first-serve basis. GFC Nature Preserve, 27305 Palos Verdes Drive East, Rolling Hills Estates. White Point Nature Preserve, 1600 W. Paseo del Mar, San Pedro. For more information, call (310)541-7613. Torrance Memorial Medical Center will host its 35th annual Holiday Festival fundraiser. More than 36 themed, decorated trees, live entertainment, the South Bay’s largest holiday boutique, Opportunity Drawing, children’s activities and food court; $5 general admission. General Public Hours: Tuesday, Nov. 27, 1:30-3:30 p.m.; Wednesday, Nov. 28, Thursday, Nov. 29 and Saturday, Dec. 1, 10 a.m. – 9 p.m., Sunday, Dec. 2, 10 a.m. to 4 p.m. Senior Days: (free for seniors and those with special needs) Wednesday, Nov. 28 and Thursday, Nov. 29, 10 a.m. to 2 p.m. Community Service Group Night: ($2 admission to nonprofit and community service group members) Thursday, Nov. 29, 4 to 9 p.m. Police and Fire Department Toy Drive: (free admission to Festival with a new, unwrapped toy with a value of $4 or more) Saturday, Dec. 1, 2 to 6 p.m., Torrance Memorial Medical Center, 3330 Lomita Blvd., Torrance. Call 310-517-4606 or visit TorranceMemorial.org/holidayfestival for more information. 10:30 a.m. At Hesse Park 29301 Hawthorne Blvd. Rancho Palos Verdes. Grace Kelly had the aura of a princess even before she was crowned. She exuded grace, polish, flair, and serenity as a fashion icon, actor, and humanitarian. “Living With Grace” is a captivating look at this elegant woman who has been an inspiration for many and whose legacy enlightens a new generation of fans. Motion picture historian Mary Mallory is the author of four books, serves on the Board of Hollywood Heritage, and is a contributor to the blog the LA Daily Mirror. Books will be available for purchase and signing by the author. pvseniors.org. 8:30 a.m. Join Wild Birds Unlimited in exploring the birds that make the White Point Nature Preserve home. All ages welcome. Binoculars supplied for beginners. The program is free and open to the public. 27305 Palos Verdes Drive East, Rolling Hills Estates. RSVP at www.pvplc.org. The Sandpipers 26th Annual Holiday Homes Tour. This year’s tour will showcase four distinctive homes in the South Bay. Each home is magically transformed for the holiday season. In addition, the Sandpipers Holiday Market, featuring local artisans and restaurants provide a unique shopping and dining experience. The Holiday Homes Tour is a popular event in the community that annually attracts over 2,000 patrons and garners tremendous support from numerous local businesses and community partners. Presale $33/Door $38. Home location addresses will be provided on the ticket. Please exchange your electronic ticket for a paper ticket at the Holiday Market. To purchase tickets visit sandpipers.org or email laraprotiva@gmail.com with any questions. Start your Holiday season with the 30th annual production of “The Nutcracker”, presented by Peninsula School of Performing Arts. A beautiful blend of professionals, pre-professionals, adults and young dancers. World renowned performer Alexander Kalinin, as Herr Drosselmeyer, weaves an enchanted story through the dreams of a young girl, Clara, and her Nutcracker. Her travels take her to the Battle of the Nutcracker and the Mouse King then to the Land of Snow, and on to the Kingdom of the Sweets, where Clara is greeted by the ever so beautiful Sugar Plum Fairy and her court. Music by Tchaikovsky and choreography by Tita Boulger, Vera Ninkovic, Marina Kalinina and Alexander Kalinin. 7 p.m. PVPA Norris Theatre, 27570 Norris Center Dr., Rolling Hills. (310) 544-0403. Adults $35, Children 17 and under $25, $7 service fee per ticket. palosverdesperformingarts.com. 9 p.m. This contemporary “blues opera” by Chris Pierce and Mark Malone. A story of love, sorrow, earthy humor, and finally, redemption. Accompany Reverend Tall Tree as he plies his trade as a street preacher in the small, dusty towns of the lower Mississippi Valley. Box Office Phone Hours are Monday to Friday 10 a.m. – 6 p.m. For more info or to purchase special ticket packages, call (310) 833-4813. Grand Annex, 434 W. 6th St., San Pedro. The Banning Museum kicks off the holiday season with their annual Victorian Christmas Weekend Celebration. The Museum grounds are transformed into a Christmas Festival featuring Victorian period entertainment, walk-thru tours of the festively decorated Banning Mansion, blacksmith demonstrations, refreshments, family holiday crafts, a bake sale, local food vendors, handmade crafts by area artisans. Jolly ‘Ole St. Nick himself will pose for photos with the little ones in an historic carriage. One of the highlights of the festivities is a horse-drawn trolley ride to the Drum Barracks Civil War Museum, also in Wilmington. Free admission. 11 a.m. to 4 p.m. 401 East “M” Street, Wilmington.For more details call (310) 548-2005 or visit.thebanningmuseum.org. Danny, John and Dan McCaw will open their studio for their third annual exhibition. Over 40 new works of original art will be on display in the environment in which they were created. Working in the same studio, a father and his two sons produce individual art in this unique symbiotic relationship. 6 p.m. – 9 p.m. McCaw Contemporary, 1269 Sartori Ave. Torrance (310) 328-7366 mccawcontemporary.com. Palos Verdes Peninsula Land Conservancy at Alta Vicente Reserve. Help restore this unique canyon habitat, home to many threatened and endangered wildlife species. 9 a.m. to 12 p.m. Sign up at pvplc.volunteerhub.com. By the Palos Verdes Peninsula Land Conservancy at George F Canyon Preserve. Bring the children for an easy and educational hike in this beautiful canyon preserve. 10 a.m. to 11 a.m. All ages. Free. 27305 Palos Verdes Drive East, Rolling Hills Estates, 90274. For more information, contact (M-F) 310-541-7613 or (S-S) 310-547-0862 or RSVP at: www.pvplc.org, Events & Activities. 3 p.m. Music Director Dr. Berkeley Price and Associate Director Mr. Justin Raines will lead the band in a concert of “Music that Inspires and Excites.” Selections will include Greensleeves, A Christmas Festival, Farandole, How the Grinch Stole Christmas, and On With the Snow! The concert will be at the Salvation Army Chapel, 4223 Emerald Street, Torrance. $10 for adults. Children 12 and under are free with an adult. Plenty of parking is available across the street from the facility..pswinds.org for more information. PV’S Elite Dance Studio returns with their holiday favorite dance production, an alternative take on Tchaikovsky’s classic. This isn’t the Nutcracker you grew up with. 2 p.m. $20, $12. Warner Grand Theatre, 478 W. 6th St. San Pedro. Phone: 310-541-0099. Email: leezcorner@gmail.com, or visit elitedancerhe.com. Rolling Hills Estates is pleased to present the Annual Palos Verdes Peninsula Holiday Parade. The “Parade of Lights” theme is designed to showcase the unique character of the Palos Verdes Peninsula. The parade route is along Silver Spur Road and Deep Valley Drive, through the Promenade on the Peninsula to Norris Center Drive (Crossfield Drive) in the City of Rolling Hills Estates. Awards ceremony at The Promenade on the Peninsula. 6 p.m. (310) 377-1577 or visit ci.rolling-hills-estates.ca.us. Torrance near PCH & Calle Mayor. The quiet neighborhood in south Torrance turns into one of the largest displays of Christmas lights and decorations in the country every year. Drive slowly through, or walk the hilly neighborhood. Walking offers a much more relaxed, up-close view of all the displays. Every house in the neighborhood attempts to outdo their neighbors. Make sure to bring cash for the hot cocoa and snack stands sprinkled throughout the neighborhood. Bring the kids for an experience they will never forget, with a Santa Claus, sleighs in yards and much more. There is always a diverse array of themes on display from military, Christian, Jewish, Spongebob, Chicago Cubs, etc. The extravaganza is hidden down the hill behind PCH near Calle Mayor on Doris Way and Linda Drive. SHCLE is on display from 6 – 10 p.m. every night until the evening of New Year’s Day. The community is invited to have lunch with Santa. Includes face painting, crafts, clowns and photos with Santa (bring your camera). Price includes a ticket to Torrance Memorial’s 35th annual Holiday Festival, which features 36 custom-decorated holiday trees. Tree themes include “Howling Holiday,” featuring frisky dogs at play, “How the Grinch PINK’D Christmas,” symbolizing breast cancer awareness, “The Power of Music,” gilded with gold instruments, and “ELVEN Enchantment, adorned with elves playing instruments.” Shop in the South Bay’s largest holiday boutique or in the Children’s Marketplace or Senior’s Marketplace for one-of-a-kind stocking stuffer items under $5. Torrance Memorial Medical Center, Hoffman Health Conference Center, 3315 Medical Center Drive, Torrance, CA, 90505. Cost: $15 per person (minors must be supervised by a paid adult). Call 310-517- 4728 or visit www.TorranceMemorial.org/holidayfestival to purchase tickets or for more information. At Hesse Park 29301 Hawthorne Blvd. Rancho Palos Verdes. Commodore Everette Hoard returns to tell us about the history and maritime achievements of the RMS Queen Mary, one of the greatest liners to ever sail the seas. Now docked permanently in Long Beach, the ship is now a hotel and tourist attraction, but it still remains the last remaining example of the golden age of the great liners. 10:30 a.m. Pvseniors.org. Special needs students from the “Ready, Willing and Able” dance and performing arts program will performing onstage at the sixth annual Holiday Showcase and outreach event from 4-5 p.m. at the Norris Theatre. At this year’s show, “’Twas the Night Before Christmas…RWA Style!” No tickets or reservations are required, but donations to the program are appreciated. Norris Theatre, 27570 Norris Center Dr., Rolling Hills Estates. For more information about the program, contact the Palos Verdes Performing Arts Conservatory at (310) 544-0403, ext. 303. At the Grand Annex showcasing musicians and spoken word artists. Every first Thursday of the month, in conjunction with the San Pedro Arts District’s First Thursday ArtWalk. The Grand Annex has hosted Grammy winners and nominees and regionally acclaimed musicians across all genres. Sign-up begin at 6:30 p.m. $5 includes one beer, wine or soft drink and snack. All Ages Event. 434 W. 6th St., San Pedro, (310) 833-4813. San Pedro City Ballet, home of American Ballet Theatre superstar Misty Copeland, presents its 25th annual production of The Nutcracker, with artistic direction by Cynthia and Patrick David Bradley. Join Clara on a dreamlike journey with a dancing Nutcracker, mischievous mice, sparkling snowflakes, and a magical Christmas tree. Friday, December 7 – Sunday, December 9. Times vary. Warner Grand Theatre, 478 W. 6th St. San Pedro. Tickets and showtimes at sanpedroballetschool.com. Enjoy a guided tour led by the Los Serenos Docents. 2:30 p.m. – 3:30 p.m. Hike past the unique native flora and fauna and explore the tide pools teeming with fascinating marine life. The hiking difficulty is moderate to strenuous. The trail to and from the tidepools is approximately a mile and involves about a 120 ft change in elevation. This is a kid friendly hike but the trails and rocky beach are unsuitable for baby strollers. No dogs are allowed on the beach. Free. Parking fees waived 45 minutes prior to the event and 30 minutes afterwards. Rain cancel. For more information, please call 310-544-5366 (Abalone Cove), 310-544-5375 (PVIC Museum) or visit our website at www.losserenos.org. 5970 Palos Verdes Dr. South, Rancho Palos Verdes. Palos Verdes Peninsula High School Athletic Booster Club will hold a Holiday Boutique in the Kelly Johnson Fieldhouse. 10 a.m. to 4 p.m. Proceeds benefit the Athletic Booster Club which funds equipment, a full-time sports trainer, and athletic program enhancements. The “pop-up” boutique features nearly 20 local vendors of clothing, jewelry, gourmet olive oil, bath products, tree ornaments, home decor and more. Great deals on artisan gifts. 27118 Silver Spur Rd. Rolling Hills Estate, pvphsabc.com. At George F Canyon by Palos Verdes Peninsula Land Conservancy. 9 a.m. Wander along a willow filled canyon stream with coastal sage scrub restored habitat. Look down on the Peninsula’s rare Catalina Schist from one of the few places you can see the rock exposed. An easy to moderate walk. Park in lot, 27305 Palos Verdes Drive East, Rolling Hills Estates. For more information, please contact (310) 541-7613 ext. 201 or sign up at www.pvplc.org. Join the Palos Verdes Peninsula Land Conservancy at George F Canyon Nature Preserve in the nature center for hands-on science-based activities where children of all ages can learn about a special species: this month The Raven and Crow! 10 a.m. to 11 a.m. Free. 27305 Palos Verdes Drive East, Rolling Hills Estates. For more information, contact (M-F) 310-541-7613 or (S-S) 310-547-0862 or RSVP at: www.pvplc.org, Events & Activities. With the Palos Verdes Peninsula Land Conservancy at the White Point Nature Preserve. 10 a.m. to 11 a.m. Share the joy of storytelling with your children and introduce them to the beauty of the natural surroundings. Your family will enjoy spending time with retired Children’s Librarian Carla Sedlacek for stories and activities featuring nature themes, exciting props and songs. This month features The Raccoon. Free. 1600 W. Paseo del Mar in San Pedro. RSVP at www.pvplc.org Events & Activities. Santa is visiting Peninsula Shopping Center and will be available for free photos. He is bringing along kids crafts, games, face painting, DJ dance parties, balloon art and there will be magical “snowfall” falling from the sky!. 12 – 2 p.m. Live, on stage performance by PV Ballet at 12 p.m. 67 Peninsula Center, Rolling Hills Estates. The event will take place in the drive isle near La Salsa. For questions call (310) 541-2242 or visit peninsulashoppingcenter.com. The all-star tribute celebrates the best of the ’30s and ’40s Big Band era, combining famous favorites like “Little Brown Jug” and “Tuxedo Junction” with holiday classics, with the Tex Beneke Orchestra. The Modernaires (“Chattanooga Choo Choo”) and vocalist Leigh Vance join bandleader Gary Tole for a joyful trip down memory lane. $40-$80. For more information or to purchase tickets, call the box office at (310) 544-0403 or go to palosverdesperformingarts.com. The Norris Theatre is located at 27570 Norris Center Drive in Rolling Hills Estates. Join the Neighborhood Church in celebrating the Christmas Season with a free family event. 5:30 p.m. to 7:30 p.m. The 65th annual Christmas Pageant retells the Christmas Story through nine live action scenes set up throughout the beautiful oceanside church grounds. Actors, real animals and live music. The Pageant has been a family favorite on the Peninsula for over 60 years. All are welcome 415 Paseo del Mar, Palos Verdes Estates. For more info, visit ncpve.org. Celebrate merry moments and memories as we sing and dance to some of your favorite holiday songs and a few new ones too. Liz Cantine, former professional dancer and choreographer, will return with her Tap Happy and Lyrical Lady dancers and vocalists to entertain and share happiness through dance and song. 10:30 a.m. At Hesse Park 29301 Hawthorne Blvd. Rancho Palos Verdes. pvseniors.org. 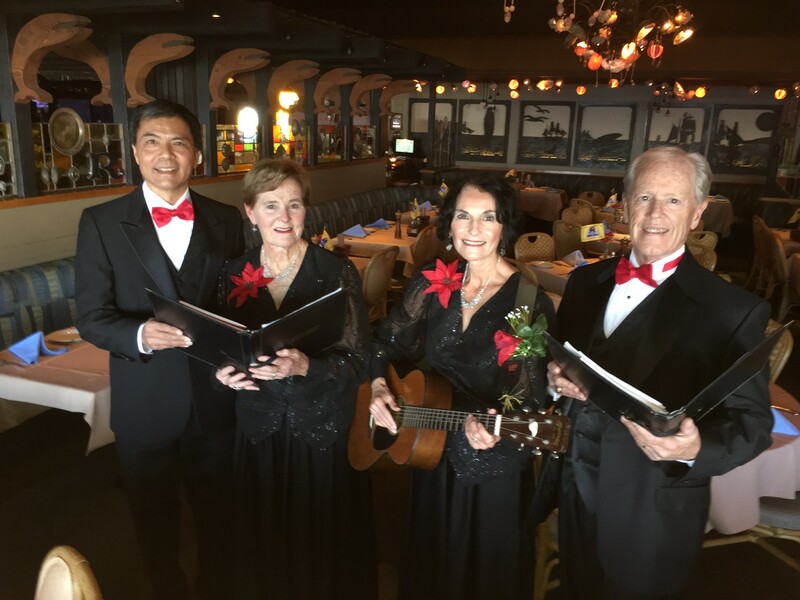 The Admiral Risty presents the Los Cancioneros Master Chorale Ensemble who will perform Christmas and Chanukah favorites tableside for the enjoyment of dining guests. 6:30 p.m. 31250 Palos Verdes Drive West, Rancho Palos Verdes. Reservations recommended (310) 377-0050 or visit admiralristy.com. 10 a.m. to 11 a.m. By the Palos Verdes Peninsula Land Conservancy at George F Canyon Nature Preserve. Put on your grubbies and take part in a kid friendly habitat restoration activity: plant seeds, care for native plants, and track wildlife. Children of all ages will begin to understand the role that they can play in nature conservation. Free. 27305 Palos Verdes Drive East, Rolling Hills Estates. For more information, contact (M-F) 310-541-7613 or (S-S) 310-547-0862. RSVP at: www.pvplc.org, Events & Activities. enjoyment of dining guests. 6:30 p.m. 31250 Palos Verdes Drive West, Rancho Palos Verdes. Reservations recommended. (310) 377-0050 or visit admiralristy.com. By the Palos Verdes Peninsula Land Conservancy at White Point Nature Preserve. 8:30 a.m. Join Wild Birds Unlimited in exploring the birds that make the White Point Nature Preserve home. All ages welcome. Binoculars supplied for beginners. Free, open to the public. White Point Nature Preserve is located at 1600 W. Paseo del Mar in San Pedro. RSVP at: www.pvplc.org, Events & Activities.